I'm addicted to Flex, this is my therapy. Something I’ve been wanting for a while was a slick way to have “bookmarks” in my code to help me jump quickly to certain places in the source files. It’s not uncommon for me to have a long list of files open in Flash Builder. Some files are unnecessarily large, with far more functions than should be there. These problems are something we are all guilty of at one point or another. I recently installed the trial version of SourceMate 3.0 from Element River. It’s got a ton of productivity enhancements for Flash Builder 4.5+. It doesn’t have a bookmarks feature, but what does it does have is task tags. I really like this feature in general but I found it can be used to create bookmarks. 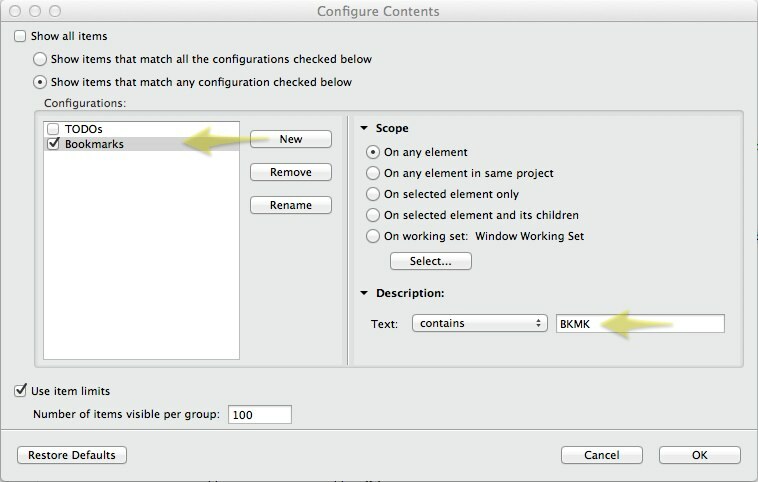 I created a new tag “BKMK” in the SourceMate tags preferences (Preferences > SourceMate > TaskTags). Now, when I add a comment that starts with BKMK, it will show up in the tasks view. 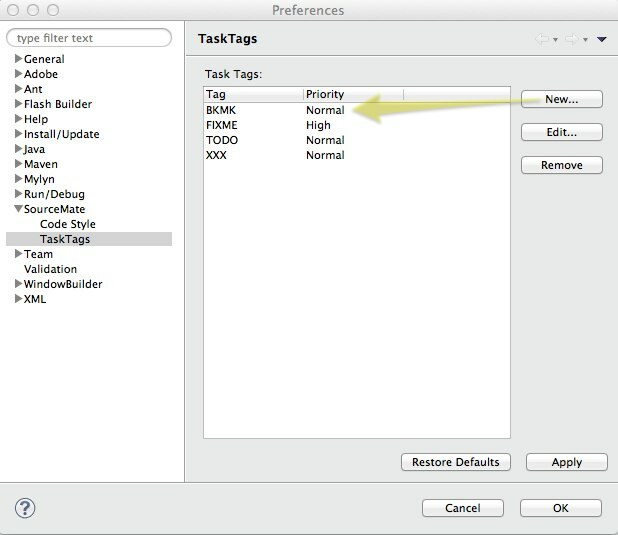 Then, using the menu for the tasks view, I showed a new view and named it Bookmarks. I chose Configure Contents… from the menu and created a new configuration called Bookmarks. For that configuration, I added Text: contains BKMK. Leaving that dialog and returning to the Flash Builder window, I chose Show > Bookmarks for that tasks view and viola, this Bookmarks view will always show the list of BKMK items I’ve placed inline in my code. This requires adding lines to the source code, so unlike breakpoints, it requires modification but can still be a pretty good workaround for the time being.